Don Pardo—sophisticated narration on "I'm The Slime"
John Belushi—Samurai Futaba on "Purple Lagoon"
Full show rebroadcast Oct. 1998, on Canadian Comedy Network. Also on Dec. 8th, 2001 on NBC. GREAT NEWS! FZ's complete appearance on Saturday Night Live from 12/11/76 will be out on DVD on December 4, as part of the complete SNL Second Season set. Hope you'll like it! 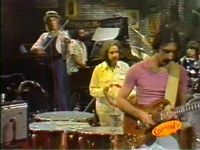 Zappa made two SNL appearances. The first appearance was December 11th, 1976, and the show was a christmas theme. The band was the same for the Zappa in New York album. The lineup included Terry Bozzio, Patrick O'Hearn, Ray White, Ruth Underwood, Eddie Jobson, David Samuels, Lou Marini, Ronnie Cuber, Tom Malone, and the voice of Don Pardo, though he didn't appear. Oh yes, and John Belushi. And there are also a couple of mystery peformers which remain unidentified, as Charles Ulrich points out. The songs performed this episode were "I'm The Slime", "The Purple Lagoon", and "Peaches En Regalia." "I'm The Slime" came off pretty well. The band was tight, and there was a television over the audience with an image of the band that was rigged somehow so that foaming goo representing the slime was oozing out of it. When it came time for the part that Don Pardo recites on ZINY, Frank presented a large blackboard with the words and guided the verse with a pointer. The real high point was "Purple Lagoon". The band was really firing on all pistons for that one, and Frank looks like he was in composers' heaven. A classic pose. He stands there waving a baton, smoking and grimacing, conducting some of the most difficult music imaginable to a highly competent and rehearsed band. Both this show and the 10/21/78 SNL appearance had been in circulation in various degrees of crappy quality. Then in fall of 1998 both shows were rebroadcast on the Comedy Network in Canada. As a result there is a small logo reading "Comedy" in the lower right hand of the screen throughout the shows, but in exchange the quality is pristine. A small price to pay for this show having been fully restored, as the only previously known copies of this show were of pretty awful quality. On that first show, Frank & band actually did 3 songs. They performed a very lively "Peaches en Regalia"; unfortunately, when the SNL shows were later rerun in the '80s in a one-hour format (and after VCRs became available to the general public), "Peaches" was cut, which is why very few copies of that song on the show survive. I have a copy, but the quality is so awful that it's barely watchable even for a fanatic like myself. A few visual highlights of that particular "Peaches" performance: Eddie Jobson plays a clear-plastic violin; and Frank, Ray White, & Patrick O'Hearn bow and make some kind of semi-religious gesture toward Terry Ted during his brief solo. Also, it was closer to Xmas than to Hween; thus all the references to Xmas in the show (Candice Bergen introduces the first song as "a special Xmas treat, the mellow sounds of FZ," or words to that effect). Plus Frank made a brief appearence in the "Killer Xmas Trees" sketch; one of the trees killed him in a police lineup. I saw it when it happened, on a tiny little black&white TV. I noticed you wrote something about the SNL episodes with Zappa performances airing on Comedy Central in Canada. I've been trying to get these for some time (I'm in the US; New York to be specific). I've talked with an SNL exec who said NBC lawyers are fighting it out with the Zappa Family Trust over these shows, and to not hold my breath. Every tape I've seen of FZ on Saturday Night Live 1976 dates the show as Dec 11, 1976. I __swear__ I saw this show on Xmas night '76—live. Any thoughts? Besides, didnt Frank play the Palladium right after that?? Wouldn't they show a rerun if Christmas fell on a Saturday? It certainly wasn't Christmas day when I saw this episode. There were two weeks between the SNL appearance and thee Palladium shows. Moreover, the horn players were not all the same. The Brecker Brothers were not on SNL with FZ. See http://fzpomd.net/lineups/lineup5.html for an overview. I've just read an interview with Dave Samuels, in which he states that he did not play with the MOI in 1969. At that time he was in college in Chicago and just starting on vibes. He also says that he didn't play Saturday Night Live. See Saturday Night Live Transcripts for info about the whole episode.